The only thing we know for sure is that Bengie Molina will be winning a World Series ring this year. Most of you probably know this by now, but it bears repeating because it's pretty cool. After everybody's All-American, Buster Posey, won the starting catching job for the San Francisco Giants, the team traded Molina to the Rangers for prospect Michael Main and journeyman reliever Chris Ray. It would have been much cooler if they had traded for filmmaker Michael Mann. In an effort to build exciting anticipation for the Fall Classic, here is our overly simplified position by position breakdown. The closest call above was Neftali Feliz over Brian Wilson. Wilson has had a tremendous year and is on the upswing of a promising career. He may have been the best closer in the game this season. The reason we take Feliz is purely on the strenght of his scintilating fastball. We're wearing our scouting hat and are drooling all over the triple-digit readings of the radar guns when Feliz gets his arm cranked up. We decided not to rank the field managers because there is no way to accurately say who will do a better job managing their teams in this World Series. 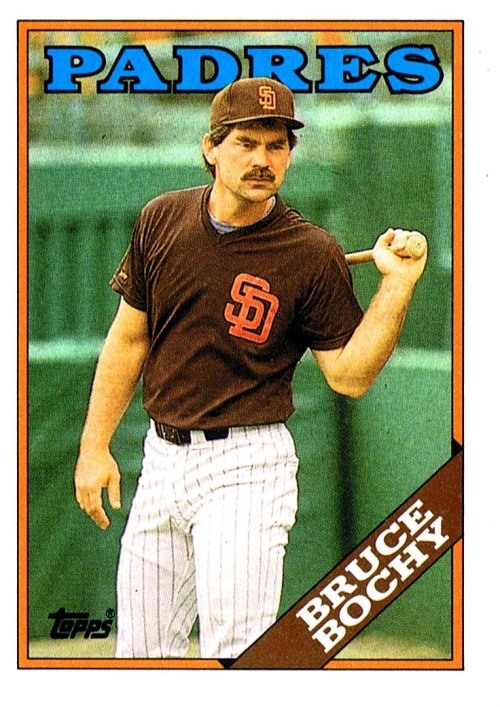 When it comes to funny baseball card pictures, Bochy never stood a chance against R-Wash.
... the Jheri Curl trumps all. Back to the games, the most striking development, for me, is the Rangers refusing to start Cliff Lee on short rest to allow him to pitch games 1, 4, and 7. Perhaps I'm making too much of this, but there is a time for babying a prized pitcher's arm, and there is a time to push it and go for the championship. The fact that Cliff Lee has never pitched on short rest is baffling to me. We're not talking about him having a poor track record on short rest. We aren't suggesting that they push him to throw on 2 days rest. The word on the street is he's not "comfortable" doing that. Well, I'm sorry, when you're making $9,000,000 this season and are looking for an offseason pay day exceeding $150,000,000 from your next team, I think it is reasonable for you to be pushed a little past your comfort zone in the last week of the postseason. In our opinion, the Rangers have the edge in many of the position head to heads. Of course, this isn't basketball, so it's not like Ian Kinsler will be playing man-to-man against Freddy Sanchez. Pitching wins championships, right? Sometimes, I think it means pitching wins postseason births and luck/timely hitting wins championships. That's where the futility of these predictions lay. Still, we're here. We need a prediction. I'm going to side with pitching and experience. We give the pitching edge to the Giants in each game, except Game 1. Why? Well, as Joe Posnanksi put it, Cliff Lee has pitched like "a little bit of Glavine AND a little bit of Maddux." If the games when the Giants are underdogs are the games when Tim Lincecum pitches, I think they will do just fine.